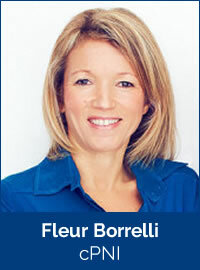 Fleur Borrelli is both a Psycho-neuro-immunology (PNI) Clinician and a Registered Nutritional Therapist. She has extensive experience in the fields of autoimmune disease, gluten intolerance, fibromyalgia and viral and bacterial infections, such as Lyme. She views her approach as part preventative, part regenerative medicine with a strong focus on the need to recognise pathways to disease. Fleur believes her focus can both help stem the tide of chronic lifestyle-related illnesses (such as autoimmune disease, chronic fatigue, depression and type II diabetes) and enhance physical performance enabling athletes to achieve new levels of fitness and physical resilience. She was invited to join panel of experts talking about the pathways to chronic disease in the global online summit Autoimmunity THE MIND factor in September 2017. Fleur also places considerable professional emphasis on weight management. To this end, she has co-written the hugely successful book ‘The In-Sync Diet‘ with the actress Glynis Barber. Fleur has a BSc in Nutritional Medicine from the University of West London (2006) and a post-graduate diploma in PNI from the Natura Foundation at the University of London (2012). She is currently continuing her studies in PNI with the Natura Foundation, working towards an MSc. Fleur is a member of the British Association of Applied Nutrition and Nutritional Therapy and is registered with the Complimentary and Natural Healthcare Council. She is also a member of the European Association of Clinical PNI.